Food delivery is big business. While most of us would love to come home to a freshly cooked meal, the reality is that most of us come back from work, slump on the couch, and fire up our phones to get dinner ordered ASAP. There’s no fault in ordering delivery, but the pressing question is which food app should you actually use? There are a plethora of delivery apps and services running around Dubai, and it genuinely can be a bit of a mystery as to why you’d want to pick one over the other. So in the interest of science (and our bellies), we took the five most popular food delivery services – Zomato, Uber Eats, Careem Now, Deliveroo, and Talabat – and pitted them against each other to see who’d come out on top across various criteria. 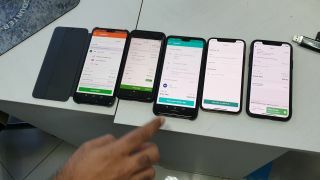 In order to make the test fair, we would be placing the order simultaneously across all five services using their associated app (either on Android or iOS), from the same restaurant branch. We would also be ordering the exact same thing (a burger with fries and vanilla shake) so that there was no discrepancy between any of the orders. All orders were placed at 12:15pm and accepted immediately by the restaurant. When it came to speed of Delivery, Deliveroo was the first to arrive to our offices, two minutes earlier than the estimated delivery time. Zomato and Uber Eats arrived exactly at the same time, however there was no estimated time of delivery on the Zomato app. Talabat similarly kept changing its estimated delivery time, but Careem Now was the slowest delivery with a constantly changing estimate time, making it the slowest delivery out of everyone. This refers to the quality of the delivered order, and we specifically were looking to see if anything was missing or damaged. Most delivery services allow you to report missing or damaged food back to them for refund or credit, but thankfully nothing was amiss in our orders. Each order was packed properly, and the drinks had been secured in a separate carrier and wrapped with either clingfilm or with tape – though we did find that it was harder to open up the drinks that had been taped shut. Here’s where things get interesting. The actual cost of our order was AED 60, but this price would fluctuate a bit across the different services when delivery cost was factored in. Deliveroo was the most expensive with an AED 7 delivery fee, while bother Uber Eats and Careem Now offered promotion codes for delivery on the day we ordered, thus bringing down the pricing anywhere from 10-30%. While Careem Now may have taken the longest time to arrive, it still worked out to be the cheapest order among the five. This highlights how easy the particular app was to use when it came to actually finding what we wanted to eat as well as placing the order. We found that Deliveroo had the cleanest interface, followed by Careem Now which actually divides each menu into sections so you can quickly tap to navigate to that section of the menu directly. There’s a similar layout with Zomato, though it’s not immediately evident which places actually offer delivery as the app shows all available branches for a particular restaurant. A point of confusion was how Zomato and Uber Eats labelled the size of the burger – what was known as a regular burger at the restaurant was called ‘single’ in Zomato and ‘small’ in Uber Eats, so we had to match the price of the burger to figure out the correct size. So there you have it – five contenders step forward, but in this case it was Deliveroo that won based on the pure fact that when you order something, you want it delivered in the shortest time possible, and Deliveroo certainly came through on this regard.